Maybe you have a keynote speaker who speaks a different language than your entire audience, or you have an audience comprised of language groups from around the world. Perhaps you would like to be able to bring an unknown group of people up onto your stage to speak, and you need to know that your entire audience will be able to understand and connect with what they have to say. All of these scenarios call for the provision of simultaneous conference interpretation, a service where teams of highly experienced bilingual professionals interpret in real time. 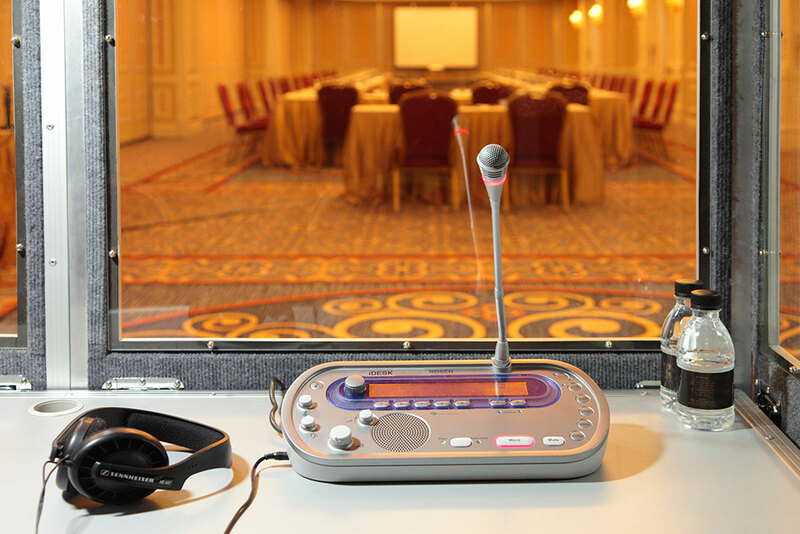 State of the art dedicated hardware enables those interpreter teams to perform to their best. The resulting audio is then relayed to your audience by one of a number of technologies depending on the nature and scope of the event. All of this comes together so that your international audience can engage, participate and feel included by your event. The provision of these services is a niche industry, and Clarus is one of the few vendors that can provide all of the personnel and equipment to service interpretaion at your event without leaning on third parties. However many languages, however many attendees, whether in a meeting room, a cruise ship, or a stadium – no matter where in the world. We have years of experience of providing solutions for all kinds of situations and can confidently create and deliver you a solution that remains on budget. Whilst any form of interpreting is an impressive skill, the unique demands of simultaneous conference interpretation require a level of knowledge, standard of performance and attention to detail that places those who specialize in it in a league of their own. These elite interpreters are primarily members of the International Association of Conference Interpreters (AIIC), and they are accredited and certified by their peers to the highest standards of performance in their craft. Interpreters normally work from a soundproof booth, in pairs, trading off every 20 minutes or so due to the demands of constantly talking. While their partner is interpreting they will be listening in and assisting by looking up terms etc. Interpreters may have experience in, or specialize in certain industries, and we take great care to match up interpreter teams who will complement each together and be able to provide the best result for the specific market or subject matter. In order for the simultaneous interpreters to be able to perform at their peak, ISO standardized technologies exist to support them in their craft. 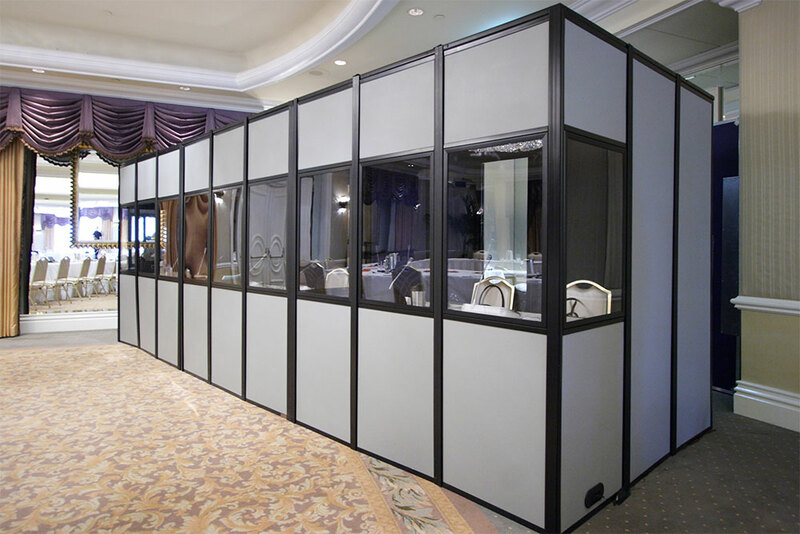 Sound isolation booths both provide them a quiet environment to work in and ensure the feed from their microphones is clear of background noise. They work at a dedicated interpreter console that provides them the ability to switch silently among their team, to chose the feed they are listening to, and provides automatic relay switching for when the floor language is changing rapidly (more on that later). The audio feeds from the interpreters are then fed to the audience via one of a number of technologies, including infrared and radio. The choice of which to use depends primarily on the number of languages being transmitted, the number of receivers that need to be distributed and the size of the entire audience area to be covered. Clarus maintains one of the largest rental inventories of dedicated conference interpreting hardware available worldwide. All of our interpreter booths are ISO standard, and all of our large scale interpreting systems are Bosch Next Generation, capable of supporting up to 32 languages with full auto relay. OK so what is auto relay? It all seems fairly straightforward that if you had a speaker on stage speaking English and several teams of interpreters who can interpret from English into say French, Japanese and Portuguese, these interpreters would have no issue, but what would happen if someone came up on stage and started speaking Japanese. Clearly the Japanese interpreters would be able to interpret back into English, but what would the chances be of having interpreters who could interpret directly from Japanese into Portuguese or French? How does this even work at somewhere like the United Nations with upwards of 20 languages being spoken? This is where auto-relay technology comes in. The language that is being spoken in the room at any time is referred to in the trade as the floor language. Then a common language, generally English, is chosen as the relay language. When the floor language changes for example to Japanese, the Japanese interpreters would start interpreting from Japanese back to English, pressing a button on their console to indicate to the system that they are interpreting in reverse. At this point, the other interpreter teams would automatically be switched over to listening to a feed of English from the Japanese interpreter booth instead of the floor, they can then keep interpreting from English into their native language. At this point the speech is being interpreted twice, hence the term relay. This functionality enables the floor language to change instantly and frequently without constant interruption on the part of the interpreters. As such multilingual meetings can work at their normal pace, and events such as conferences can bring up anyone up to talk on stage without worrying if the audience will be able to understand them.